The story of Kauna known as The Purple Violet of Oshaantu, whose story was narrated through the voice of her best friend Mee Ali. We called her the purple violet of Oshaantu. She was so delicate and she came when these flowers were in bloom. Kauna's husband, Shange, is hot tempered and an abuser, he punches his wife like a punchbag and once punched their unborn child out of her womb. More than once he almost sent her to her grave. Upon that he has a mistress down town that the whole villagers were aware of. 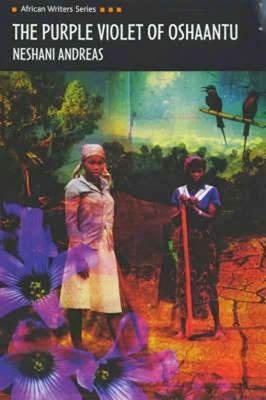 This is a novel that I really enjoyed, I like the fact that voice was given to women living in a remote village in Namibia. Also, while reading, I kept on asking myself why anybody would want to stay with a person who uses them as their punchbag? Then I realised that it is a universal problem. Even in the country where I live, according to statistics, around the average of three women per month die in the hands of their partner. Sometimes, it is just PRESSURE, pressure to stay married. SHAME, shame of what people might say (as if your life was their business), shame to be branded a failure, shame to be stigmatised. LACK OF SUPPORT, which could be from family, community, to economic support. Child, don't wait until it is too late, I know your mother wants your marriage to work. But I have seen women who have died in this thing called marriage, or have done things you don't want to hear about. I don't want it to get to this. Don't think of me, or my work. You must do what you think is best for you. Michael (Mee Ali's husband) is a good man, but this has nothing to do with me.... Shange was the man he was and again it had nothing to do with you. Don't take it personally. He would have treated any woman he married in the same way. ... he would have treated me like that too, but not just for so long.... (I would have left him) I want to be a wife, not a punching bag. This is a novel that has been in my TBR list for a long time, I have so much looked forward to reading it. Nevertheless, I cannot say it was an amazing read (though, I would have loved to), some passages simply did not keep me on the edge of my seat. However, I must say it is an interesting read and I really like it. My first read from Namibia. I highly recommend. Interesting! Here in Victoria Australia our government is holding a Royal Commission into domestic violence (also called family violence) so it is a subject much in the news at the moment. I read recently somewhere (maybe Twitter) that it's odd how often we ask, why does she stay with him? But we do not often ask, why does he do that? why does he think it's okay to do that? This challenged me, because I have so often wondered about the mystery of a woman staying to endure yet more, and yet I had not thought much about why men do this. I think books like this are important: this violence affects women all over the world, rich and poor, educated or not, with and without children and so on. Thank you for a thoughtful review. es, Lisa, that is quite a challenging question that I just stopped to ask myself when I read your comment. Why does he do that? why does he think it's okay to do that? Why do men do this? While we ask ourselves this question, in order to save our fellow women and daughters from yet another death from domestic violence, we need to teach them to value their self-worth, that is zero tolerance to violence. Most importantly, we also need to bring up our children equally. Violent men where once boys and before that babies. How come do those little cute new born babies turn into violent men? What happened? Mary, well said. The men were boys once. We mothers need to teach our boys how to control their tempers, manage their angers and build up their self esteems. I am a mother of three boys and this is quite a challenge that I have taken upon myself. Lisa has raised an important question. That said, I think your review is wonderful. I have a copy of this book, read quite some time ago and I must say I found it a bit difficult . The narration didn't flow for me. You review made it so easy. Celestine, you are right. The narrative is sort of peculiar. Give it another chance it would worth it. I'm definitely putting this one on my TBR. I've read anything from a author from Namibia. Definitely trying to read more African writers from other countries besides Nigeria. They seem to have a monopoly. I've always wondered why that is? Hahaha, noooo. Nigeria do not have a monoply. Also, it is a very populated country so it is more likely to have more writers, I guess. There are many incredible writers from other African countries. For instance, I only read one book (non-fiction) from Nigeria in the first trimetre of 2015. I purchased this book today because of this review! Though, we never agree on book review, I look forward to reading your thoughts on this one.